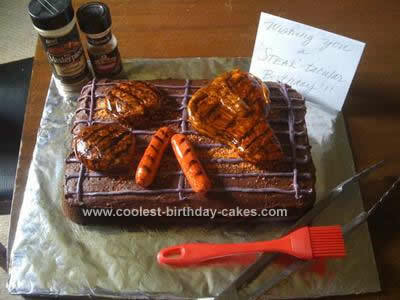 This BBQ Grill Cake was for my husband’s birthday, because he loves to grill for our family! It was a super easy cake, which I believe anyone can make! I started with a dark chocolate cake mix, baked in a 13×9 glass dish. After completely cooled I leveled it off and inverted it onto a sheet of cardboard covered with foil. I whipped up some homemade chocolate frosting and spread that over the entire top of the cake. For a glowing feeling of a hot grill, I added some orange food coloring to some coconut shreds and then sprinkled those on the top of the cake. I then worked up one large batch of marshmallow fondant. Instead of coloring the fondant, I chose to leave it white and formed the steak, burgers and hotdogs. I then made ‘water color paint’ with my Wilton gel coloring by diluting it with water. This painting technique gives a wet look to the fondant and I also found that it added to making the ‘meat’ look hot. I diluted a small amount of black and brown and red Wilton gel coloring with water. After I painted the ‘meat’ I let it dry on parchment. Then I was on to making the top of the cake look like a grill rack. I used my cookie cooling rack and pressed it into the top of the cake to give me a guide for the grill lines. Then I melted a few cubes of almond bark. I colored the almond bark a grayish black and piped it onto the top of the cake. After the almond bark dried, I arranged the meat on the ‘grill’ and placed some grilling props around the edge. I’ll have to say this cake was so much fun to make and even more fun to share and eat it truly was The Coolest Grill Cake.